If you are thinking about building Oracle Linux or Oracle VM based systems for your Oracle databases, for example building a private cloud type of system to consolidate your databases,. have you thought about the hardware infrastructure that your rest of platform will be built upon. One thing that you need to make sure is that the infrastructure stack is certified and validated for the software platform stack such as Oracle Linux/Oracle VM and the Oracle database. The nice thing about this is that as a customer, you should not spend your resources for this complex and time consuming certification and validation process as various hardware vendors will partner with Oracle to establish the validated configurations. But you need to make sure that you select the proper infrastructure and OS based on the validated configurations. Since starting working on Oracle Linux and Oracle VM in 2009 , it has been my team’s responsibility to work with Oracle Linux and Oracle VM team to certify and validate Infrastructure such as Dell servers, storage and networking components with Oracle VM and Oracle Linux Unbreakable Kernel (UEK). And we posted the validated configurations on Oracle Linux and Oracle VM Validated Configuration (OVC) website : http://www.oracle.com/technetwork/topics/linux/validated-configurations-085828.html . This website documented pre-tested , validated configurations and best practices of running Oracle Linux and Oracle VM on various infrastructure such as Dell PowerEdge servers, Dell Storage and Network. With each of the validated configuration, customers can run their production Oracle database either with Oracle Linux or Oracle VM as a database platform. You can get a completed list of the configurations with this link: http://linux.oracle.com/pls/apex/f?p=102:1. On this link, you can type a Hardware vendor name and you can get a list of the validated configuration with various hardware. For example,. if you type Dell to search, it will come back with 55 configurations as today (10/19/2016). The list consists of the latest servers such as Dell PowerEdge R930 and various Dell Storages. Besides of my presentations, I also plan to attend some technical sessions including some OakTableWorld sessions and technical deep dive sessions. I will have some meetings with Oracle engineers and product managers in Oracle virtualization, Oracle RAC and Oracle Linux . 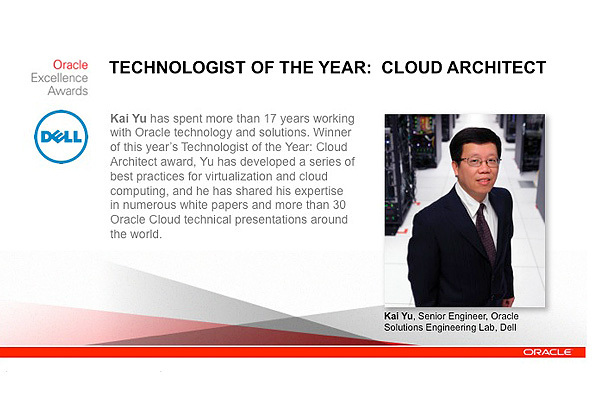 It was a great honor for me to recieve the industry prestigeous award “2012 Oracle Excellence Award: Technologist of the Year for Cloud Architect ” from Oracle Mazgine. Although I received this award at Oracle OpenWorld 2012 in San Francisco in early Octorber 2012, the award was officially announced on the Oracle Magzine’s January/Feburary 2013 issue . Provisioning Oracle RAC in a Virtualized Environment, Using Oracle Enterprise Manager. Building an Oracle® Grid with Oracle VM on Dell™ Blade Servers and Dell EqualLogic™ iSCSI Storage, Dell Oracle Solutions Whitepaper, October 2009. Provisioning Oracle RAC in a Virtualized Environment, Using Oracle Enterprise Manager, IOUG Collaborate 10 Conference Whitepaper, April 21, 2010. Oracle E-Business Suite: Migration to Oracle VM & template based deployment , UKOUG Conference Series Technology & E-Business Suite 2010, Nov 29th 2010, Birmingham, UK, and OAUG Collaborate 11 conference, EMEA OUG Harmony 2012 Conferences. The solution received the 2011 OAUG Innovator of Year award by OAUG (Oracle Applications User Group). Automatic Oracle RAC Deployment and Implementing MegaGrid using Oracle EM Provisioning Pack, Oracle OpenWorld 2007, October 2007 San Francisco, California. Case Study: Implementing the Oracle Grid Computing on Dell Hardware for Multiple ERP Applications, Oracle OpenWorld 2008, November 2008, San Francisco, California. Provisioning Oracle RAC in a Virtualized Environment, Using Oracle Enterprise Manager, Oracle OpenWorld 2009 presentation, October 2009, San Francisco, California. Oracle RAC on Oracle VM Automated Provisioning with Enterprise Manager 11g , Oracle OpenWorld 2010, Sept. 19, 2010, Session ID: S316318. As a part of Oracle Enetrprise Manager 12c cloud beta efforts, I worked with Oracle EM12c product engineers and product managers on a Dell | Oracle joint Oracle cloud project. This project aimed to architect and implement a privare cloud solution based on Oracle VM and managed by Oracle Enterprise Manager 12c. By importing Oracle VM templates into the Oracle Enterprise Manager 12c’s software library, on this project we were able to implement the self service provisioning of applications in the Oracle cloud environment using Oracle VM templates. The result of this project was presented at Oracle OpenWorld 2011, right after Oracle officially announced Oracle Enetrprise Manager 12c, total cloud control solution. Implementing Oracle Applications 11i on 10g RAC and ASM, Oracle OpenWorld 2006, October 2006 San Francisco, California. Implementing Oracle E-Business Suite R12 Through 11i to R12 Upgrade Path, OAUG Collaborate 08 presentation(April, 2008, Denver ,Colorado), Oracle OpenWorld 2007 Presentation (October 2007 San Francisco, California) (this present discussed the step by step method to migrate an Oracle EBS 11i with single node database to Oracle EBS R12 with a multiple node RAC database. RAC Performance Monitoring and Diagnosis using Oracle Enterprise Manager, IOUG Collaborate 10 Conference, Las Vegas, April 20, 2010. IOUG Virtualization SIG is going to have a two day Online Symposium on Nov 7 and Nov 8. All the presentations are online and free. Each presentation will last about 1 hour. The speakers include the experts from the user community or the virtualization product Engineers or product managers from Oracle andVMware. Come to join the opportunity to learn the latest updates of these technologies from the experts on the fields. more details and the actual presentation recording, please visit this link. You also can download the presentation pdf here. device and not LVM, which could eliminate this problem? tailor them further to your environments. disk? How different node from multiple host can access them? unzip and look at lsinventory output. Q: Can RAC on VM use ASM instead of OCFS? OS/Oracle VM files, not the database which is in ASM as said before. Q: Will there be an OVM setup for RAC One Node? command. Note the troubleshooting section at bottom of that article. physical boxes and club them as nodes in RAC implementation? Dom0),or for test (where some or all VMs may be on same dom0). and configure the virtual infrastructure before using VM template. A: Here is an outline of the steps. infrastructure configuration (step 1-6) .